The United Kingdom relies on four Vanguard-class submarines to provide its nuclear deterrent. At least one submarine is always armed and on active service, carrying up to 16 Trident II submarine-launched ballistic missiles. Each missile has a range of 7000 miles (11,000 km), and can carry 12 independently controlled warheads each capable of destroying a large city. The letters of last resort are four identically worded handwritten letters from the Prime Minister of the United Kingdom to the commanding officers of the four British ballistic missile submarines. They contain orders on what action to take in the event that an enemy nuclear strike has destroyed the British government and has killed or otherwise incapacitated both the prime minister and the "second person" (normally a high-ranking member of the Cabinet) whom the prime minister has designated to make a decision on how to act in the event of the prime minister's death. In the event that the orders were to be carried out, the action taken could be the last official act of Her Majesty's Government. The letters are stored inside two nested safes in the control room of each submarine. The letters are destroyed unopened after a prime minister leaves office, so their content remains known only to the prime minister who issued them. The letters are written as soon as a new prime minister takes office, after being told by the Chief of the Defence Staff "precisely what damage a Trident missile could cause". These are then delivered to the submarines, with the previous prime minister's letters being destroyed without being opened. 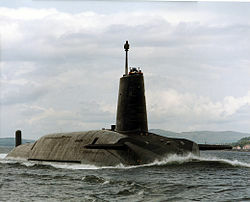 In the event of the deaths of both the prime minister and the designated alternative decision-maker as a result of a nuclear strike, the commander(s) of the nuclear submarine(s) (at any time at least one is on patrol) would use a series of checks to ascertain whether the letters of last resort will have to be opened. According to Peter Hennessy's book The Secret State: Whitehall and the Cold War, 1945 to 1970, the process by which a Vanguard-class submarine commander would determine if the British government continues to function includes, amongst other checks, establishing whether BBC Radio 4 continues broadcasting. In 1983, the procedure for Polaris submarines was to open the envelopes if there was an evident nuclear attack, or if all UK naval broadcasts had ceased for four hours. place the submarine under an allied country's command, if possible. The documentary mentions Australia and the United States. The Guardian reported in 2016 that the options are said to include: "Put yourself under the command of the US, if it is still there", "Go to Australia", "Retaliate", or "Use your own judgement". The actual option chosen remains known only to the writer of the letter, as they are destroyed unopened when a Prime Minister leaves office. In a debate prior to the 2017 general election the opposition leader Jeremy Corbyn, a lifelong anti-nuclear weapons campaigner, stated that he would write the letters of last resort if elected but did not state what option he would choose, while also saying that any use of nuclear weapons would be a “disaster”. David Greig's 2012 play The Letter of Last Resort deals with the consequences and paradoxes of the letters. The play was first staged in February 2012 as a part of a cycle of plays on "The Bomb" at the Tricycle Theatre in London, directed by Nicolas Kent, with Belinda Lang playing the role of the incoming prime minister and Simon Chandler her advisor. The production was also seen at the Traverse Theatre in Edinburgh, for the Edinburgh Fringe later the same year. The following year it was broadcast on BBC Radio 4, with the same cast, first transmitted on 1 June 2013. The KGB's attempts to obtain the contents of the letters of last resort are part of the plot of the BBC Cold War spy drama The Game (2014). ^ "Brown move to cut UK nuclear subs". BBC News. 23 September 2009. Retrieved 24 January 2011. ^ Taylor, Adam (13 July 2016). "Every new British prime minister pens a handwritten 'letter of last resort' outlining nuclear retaliation". Washington Post. Retrieved 13 July 2016. ^ Rosenbaum, Ron (January 2009). "The Letter of Last Resort". Slate Magazine. Retrieved 18 May 2009. In the control room of the sub, the Daily Mail reports, "there is a safe attached to a control room floor. Inside that, there is an inner safe. And inside that sits a letter. It is addressed to the submarine commander and it is from the Prime Minister. ^ Rosenbaum, Ron (January 2009). "The Letter of Last Resort". Slate Magazine. Retrieved 18 March 2012. [E]very prime minister in recent years has written such a letter and ... letters that go unused (Tony Blair's for instance) are destroyed without being read. ^ a b Norton-Taylor, Richard (11 July 2016). "Theresa May's first job: decide on UK's nuclear response". the Guardian. Retrieved 13 July 2016. ^ Bunkall, Alistair (13 July 2016). "May To Be Handed Keys To Nuclear Red Button". Sky News. Retrieved 13 July 2016. ^ "Theresa May's grim first task: Preparing for nuclear armageddon". Politico. 15 July 2016. Retrieved 15 July 2016. ^ "HMS Apocalypse: Deep in the Atlantic, a submarine waits on alert with nuclear missiles that would end the world..." Daily Mail. London. Retrieved 10 May 2012. ^ Rogoway, Tyler (1 February 2017). "Letters Of Last Resort Are Post-Apocalyptic Orders for UK Vanguard Sub Crews". The Drive. Retrieved 3 December 2018. ^ Smith, Adam (29 May 2017). "Lifelong anti-nuclear campaigner Jeremy Corbyn says he'll issue orders to Trident commanders". Metro. Retrieved 20 June 2018. ^ David Greig, The Letter of Last Resort (full text of play), front-step.co.uk (David Greig's official website), posted 30 September 2015. ^ "Saturday Drama, The Last Resort". BBC Radio 4 website. 1 June 2013. Retrieved 1 June 2013. ^ Frost, Vicky (7 May 2015). "The Game recap: series one, episode two – Operation Glass is revealed". The Guardian. Retrieved 14 November 2018. Hennessy, Peter; Knight, Richard (30 November 2008). "HMAS Apocalypse: Deep in the Atlantic, a submarine waits on alert with nuclear missiles that would end the world..." Daily Mail. Retrieved 10 February 2015. "The Human Button". BBC Radio 4. 2 December 2008. Retrieved 10 February 2015. Rosenbaum, Ron (9 January 2009). "The Letter of Last Resort". Slate. Retrieved 10 February 2015. Radio archive: Glass, Ira (22 January 2010). "399: Contents Unknown (Prologue)". This American Life. Retrieved 10 February 2015.